In this step we're going to add a contrail to our plane. We're going to draw this contrail with a special clouds brush. The Realistic Clouds tutorial shows how to make a clouds brush in case you're interested to know how to make one. In this tutorial we're going to use the clouds brush that was created in that specific tutorial. Select the Brush Tool and click on the button in the options bar marked with A in the screenshot. Select the brush that you downloaded earlier and click on load. Activate the brush by selecting it in the Brush Preset picker window that you opened earlier by clicking on the button in the options bar marked A in the above screenshot . You can find the clouds brush all the way at the bottom of the list of available brushes. Enter the value 7 for Master Diameter (D). Make sure that the Opacity (E) for the brush is set to 100%. Click on the Create a new layer icon in the layers palette to create a new layer. 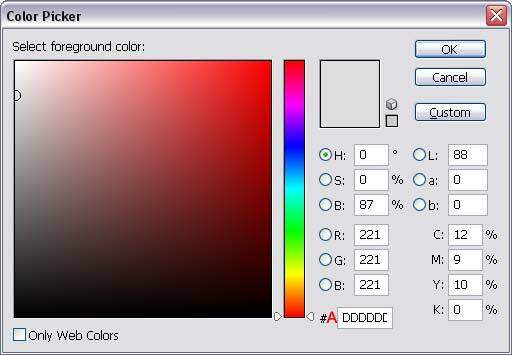 ...to open the Color Picker window. press the mouse key but don't release it yet. Add a layer mask to our contrail layer by clicking on the Add layer mask at the bottom of the layers palette. With the mask still active (double border), hold down the shift key and draw a gradient from the left edge of the mask all the way to the right edge of this same mask (it's the same technique we used to draw the contrail). Release the shift key again when you're done. Note: we needed to use the shift key to draw a gradient under a perfect straight angle. So the reason why we removed the mask is to actually apply it to the contrail layer. Maybe a strange way to do things, but an effective way nevertheless. Now that we've removed the layer mask, we're able to add the same layer mask that is already attached to our plane layer; with the contrail layer active (again, notice the double border), click on the plane's mask and drag/drop it on the Add layer mask icon . We had to copy the mask, because our contrail will have to act the same way as our plane does (like we saw at the end of the previous page), otherwise we would have an odd animation in which the contrail would always stay behind the brightest white clouds. Note: there is no need to remove the link symbol between the contrail layer and the mask we just copied, because there isn't one. It turns out that Photoshop only adds the link symbol if you create a new mask from scratch. Click on the plane thumbnail in the layers palette to make the plane layer active (it will have a double border at A in the next screenshot) and select the move tool in the tool bar. 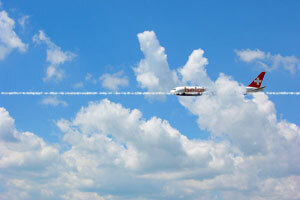 Move the plane out of the clouds and to the left side of our image with the same amount of space between the plane and the upper and bottom edge of the image. Select the contrail layer by clicking on the contrail thumbnail in the layers palette and move the contrail just behind the left engine of the airplane (leave some space between the engine and the contrail). Adobe has changed the way we link layers in Photoshop CS2. 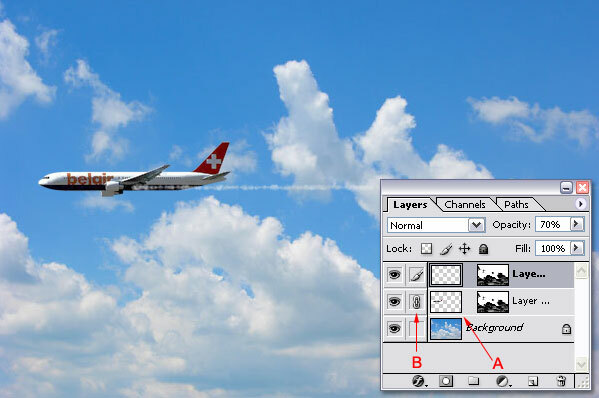 If you use Photoshop CS2 you need to click on the contrail thumbnail first, hold down the shift key and then click on the plane thumbnail in the layers palette. After releasing the shift you have to continue by clicking on the link icon at the left bottom of the layers palette (A); the layers will then be linked, confirmed by the two link icons that appear in the layers palette (B). Both layers are now linked, meaning that the contrail will now follow the plane from right to left and that's exactly what we need for our animation. Hold down the shift key and press the cursor right key on your keyboard a few times until the plane has totally disappeared. Continue on the next page where we will make this plane fly through the clouds.